This week our children have participated in Anti Bullying week. The theme for this year has been “The Future is Ours, Safe fun & Connected. They have been involved in many activities, ranging from circle time about friends to “Victim Bully” posters. Year2 have a watched a video about how other schools tackle bullying. They had a debate about what bullying is and discussed what to do if they think they are being bullied. They worked in pairs to write a piece of work about bullying, they even got to make some ‘Anti-Bullying Week’ posters for school too. Say ‘No’ to bullying! Year four have spent lots of time this week thinking about bullying. We have had in depth discussions regarding what bullying is, why people bully and the different types of bullies. We created posters in groups to show the feelings caused by bulling to both the victim and the bully. After that, we began designing anti-bullying websites that we are currently manufacturing. We know there are different types of bullying: cyber bullying, emotional bullying, physical bullying and prejudice. All types of bullying is wrong. We found out that sometimes people get bullied for the way they look, the things they believe in or their opinions or how clever they are. It is important that people who are being bullied should always tell a teacher or an adult they trust. 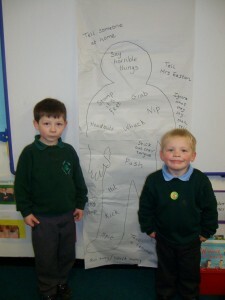 We acted out role plays of different situations to show what you could do if you or someone you know was being bullied. On Monday afternoon with we looked at a video clip about how to tell someone you are being bullied, we came up with some good ideas. After that we watched one more video about a girl being bullied because of her skin and how she got over being bullied. After we had watched all the video clips we did a task, we had to design a poster about all different types of bullying like cyber, physical and emotional and it was like a comic strip with pictures and questions about what you would do if you where in that persons situation. After that we shared them with the class and that all where really good. All KS2 have participated in assemblies which have focused on the main aspects of what they should do, should bullying occur. Clover Hill are very proud to have the BIG AntiBullying Award. This award celebrates our excellent practice and gives us recognition for our achievement. The award shows that Clover Hill schools and takes bullying and inclusion seriously.